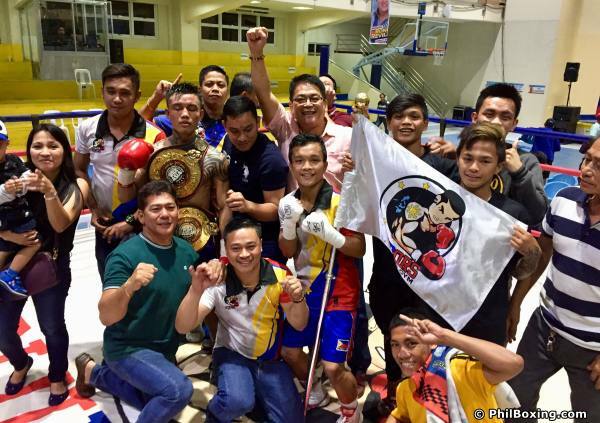 Bacoor, CAVITE -- In exciting hard fought battles, Quibors fighters Alphoe Dagayloan and Ar Ar Andales satisfied their local fans by winning the WBA Asia titles in their respective feature wars Saturday evening (Jan 26) here at the Strike Gym across Bacoor City Hall, Cavite. The victories not only earned Dagayloan and Andales coveted belts, but also most likely a place in the WBA world rankings. In the main event, Alphoe Dagayloan (12-2-5, 5 KO's) scored a 12-round split decision win over tough Boholano Danrick Sumabong (7-2, 6 KO's) of the Harada Boxing Stable to capture the vacant WBA Asia Flyweight belt. Prior to the fight, the more accomplished Dagayloan, 27, appeared to be a notch above the younger Sumabong. But above the ring Saumabong, 20, proved to be a tough, strong and resourceful warrior able to take vicious blows from Dagayloan, landing his own ones, while enduring a cut over his left eye, a product of an unintentional clash of heads. At the end, it was Dagayloan who emerged victorious by split decision, not an easy win at all. No knockdowns were recorded. The third man was the experienced Silvestre Abainza. 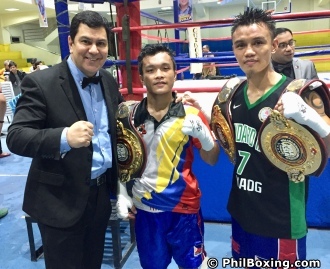 In the co-main feature, unbeaten 19 year-old Quibors fighter Ar Ar Andales (9-0, 2 KO) stopped in five chapters the taller Charlie Malupangue (7-4-3, 6 KO's) of the Cairo Sy Boxing Stable to capture the vacant WBA Asia Minimumweight strap. The brave Malupangue was rocked to the canvas twice in the fourth chapter, each time bravely getting up, but just to be forced down again in the following stanza in which veteran referee Ferdinand Estrella counted him out at 1:02 mark in round five. In a very close, tough featherweight duel, Rustom Doronio (4-1-1, 3 KO's) of the Quibors Stable and unbeaten Jay Lloyd Quidlat (3-0-1, 2 KO's) of the Visayas Boxing Stable in Iligan City fought to a six-round majority draw. The taller Doronio, 20, began aggressive, taking the first round in the judges scorecards, but warrior-spirit Quidlat fought back over the following rounds scoring with tough hands over Doronio, no conceding an inch. The blows delivered by Quidlat seemed heavier and more damaging during the back and forth action, but Quidlat, 20, a relative of Manny Pacquiao, had to settle with a draw. Moreover, Quibors fighter Ron Anthony Mitra (1-0-2, 1 KO) and rookie Jun Jun Jimenez (0-0-1, 0 KO's) of Nueva Vizcaya battled to a majority draw in their four-chapter bantamweight skirmish. Both men performed well, landing on each others through out the engaging battle, which was Jimenez' first pro fight. Plus, Jopher Marayan (8-12-2, 3 KO's) of Lipa City, Batangas, fighting out of the Quibors Gym bested late sub Julius Bala (4-12, 2 KO's) of El Salvador, Misamis Oriental in a unanimous decision win. Their six-stanza symphony of leather had its good moments of action with Marayan dominating in the scorecards. Camerines Sur in the very first round of their scheduled 4-rounder combat. Too fast and too powerful were the attacks of Bayubay over the unheralded Mino who had a really rough night. The WBA Asia double header at Strike Gym in Bacoor, Cavite, was a production of Quibors Boxing of promoters Joseph Quibral and Gerry Balmes. Manager Orlando Borcelango. Matchmaker is the popular Jimmy Vallares Jr. The author Carlos Costa is a Panama-born veteran fight reporter living in Cebu, Philippines. Carlos can be reached by email carlos512@hotmail.com and WhatsApp +639184538152.